Israeli forces fired rubber bullets to disperse protesting Palestinians outside the Temple Mount or al-Ḥaram al-Sharif (Noble Sanctuary) as referred to by Muslims, in Jerusalem, injuring three people, including Palestinian political figure Mustafa Barghouti. Dozens of Palestinians, who gathered outside the compound for the evening prayer Monday hurled stones and other projectiles at Israeli guards, Haaretz reported. According to the paper, clashes eventually erupted between the police and the worshipers at the Lions Gate leading to the compound. Israeli security forces fired rubber bullets to disperse the crowd, injuring three people, according to Palestinian sources. The Palestinian Red Crescent said Barghouti, chairman of the Palestinian National Initiative, was among those hurt. The 63-year-old was reportedly hit in the head with a rubber bullet and taken to the Al-Makassed Hospital in East Jerusalem. Footage from the scene showed, Barghouti, a former Minister of Information in the Palestinian unity government, holding his bleeding head. Earlier, Fatah called for a “day of rage” across the occupied West bank, urging demonstrations and protests at Israeli checkpoints. The sacred, but contested site, was closed for the first time in decades after two Israeli police officers were shot dead by three Arab-Israeli attackers Friday. The compound was reopened Sunday after Israel implemented additional security measures, including metal detectors at the compound to prevent further incidents. Palestinians view the move as a “severe violation of the status quo” and have refused to enter the Noble Sanctuary until the new measures are retracted. Muslims prayed outside the complex Sunday in protest, with scuffles also breaking out. 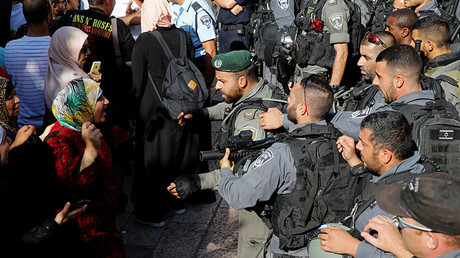 At least four people were reported injured as Israeli security forces dispersed a crowd of 300 at the compound’s Gate of Trines.